As chance would have it, I had mentioned this “Laconic phrase” that very morning in Western Civ.! The Persians say, “Give up your weapons!” and the Spartans reply: “Come and take them” (“Molōn Labe”). 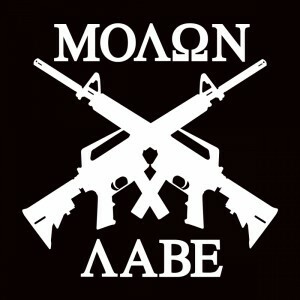 This has resonance in American gun culture for obvious reasons. 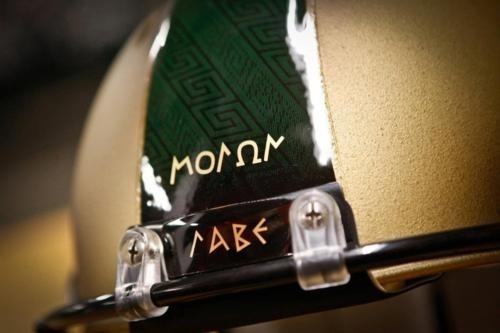 The Michigan State Spartans use it on their helmets too. Although I think my personal favorite is “If we win this war, you will be slaves forever!” to which the Spartans gave the monumentally Laconic reply: “If”. This entry was posted in Greeks and Romans by jgood. Bookmark the permalink.